Margery was born in Chicago, IL, and graduated college with a teaching degree. She married Jay John Barnings in 1943, started a family having three sons; Russell James, and Jack. The family moved to So. California in 1956. She taught 3rd grade for many years. She later returned to college and completed her Master Degree in Special Reading Education while still teaching. She taught reading to various grade levels for the remainder of her 30 year teaching career. She was very involved throughout her life in music. She played violin for the Downey and Whittier Symphony Orchestras, and the Methodist Church in Downey, CA. 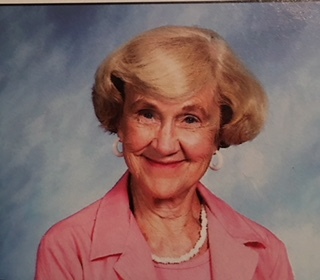 She was an active Member of P.E.O., her Bridge Club, Garden Club and many other civic organizations. Her services will be on Saturday, March 30 at 2pm. First United Methodist Church, 13222 Bailey St., Whittier 90601.